Both the EMBRIO Research Goals and the Strategic Goals of the EMBRIO Initiative will have to be continuously advanced and revised in order to remain in line with the actual research needs of Indonesia in the field of Marine Biodiversity and to allow for future-oriented research innovation. This requires the steering by boards of well-informed, distinguished scientists and decision-makers. 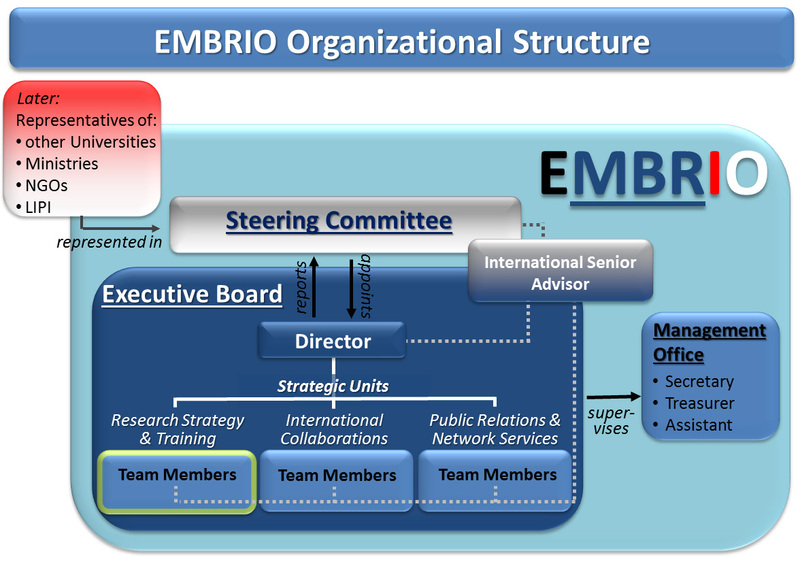 To promote concerted Research & Training efforts, to develop strategic International Collaborations, and stimulate an intense dialogue within the EMBRIO Network, three Strategic Units were established within the EMBRIO Executive Board, headed by the EMBRIO Director and advised by an International Senior Advisor who works in close cooperation with the EMBRIO Steering Committee. The daily activities and the organizational tasks by the EMBRIO Initiative are supported by the EMBRIO Management Office.